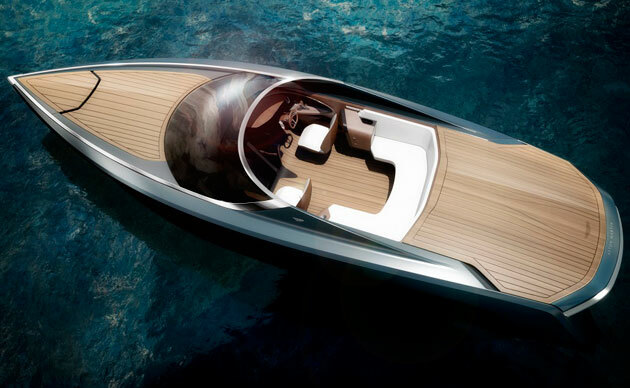 Motorboat & Yachting: The Aston Martin powerboat by Quintessence Yachts will feature a convertible roof and an espresso machine that can be controlled remotely. The AM37 was announced at a press preview event in April, when initial details were thin on the ground. However, with the Aston Martin powerboat’s Monaco Boat Show debut fast approaching, the specifics are starting to come out. Quintessence Yachts will be fitting the AM37 with a sliding carbon-fibre deck cover, which allows owners to protect the interior from the elements without the inelegant hassle of canvas and elastic. As the renders above show, this will cover both helm seats and the C-shaped seating area in the aft of the cockpit.